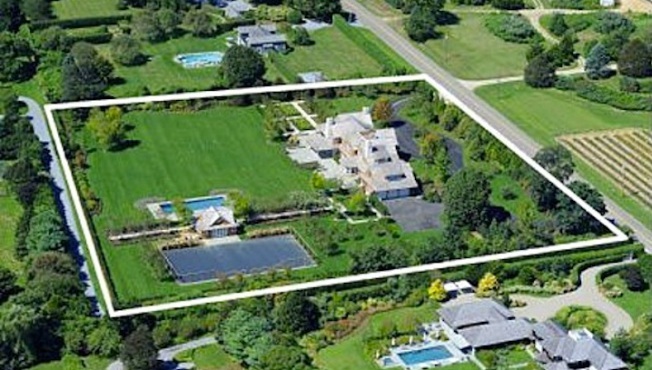 This 3.65-acre estate in Sagaponack, New York could be yours for $23 million. According to a listing description of this newly constructed mansion in Sagaponack, New York, "who needs Downton Abbey when there is this 8,409 square-foot residence," reports Curbed. That might be a stretch, but the price reflects that of a castle--the 3.65-acre estate is set at $23 million. That gets you nine bedrooms, 13 bathrooms, a tennis court, swimming pool, pool house, and the satisfaction of telling Robert Crawley that his digs aren't that impressive after all. One side is described as having "wood shingle arches, bows, and flares with wooden brackets and corbels in a tastefully refined manner." And if that does not scream castle, I don't know what does. The residence boasts nine impressive bedrooms on three floors with elevator access to all levels. Outdoors, there is a fireplace under the covered porch, which leads to terraces perfect for entertaining, with fieldstone sitting walls. There is a library with a private porch off the living room and a media room connected to the family room. A mud room connects the kitchen, three-car garage, front and back entrances, laundry, powder room and back staircase. Sunlight spills into the sprawling second floor master suite, which includes a roof deck. A central roof observation deck gives 360-degree views of the landscape. On the lower level, there's a game room, fireplace sitting area, wine room, home theater, and gymnasium complete with bathroom, steam shower and sauna. The pool house alone is 1,200 square feet, and has a bar, kitchenette, steam shower, sauna, spa lounge and bathroom. Oh, don't forget about the tennis court, 60-foot pool, spa and pergola. What's not included, that you might have to supply for yourself, is breadcrumbs.